NATHANIEL PENDLETON. Manuscript Document Signed as Federal Judge, District of Georgia. 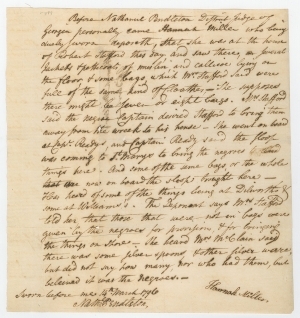 Deposition of Hannah Miller, March 14, 1796, St. Marys, Georgia. Nathaniel Pendleton (1756-1821) was born in Virginia and read law with his uncle Edmund Pendleton. He entered the Revolutionary War Army at the age of 19, and served as aide-de-camp to General Nathanael Greene in the southern campaigns. He practiced law in Savannah, Georgia after the war, and served as the state’s Attorney General from 1785 to 1786. In 1789, President George Washington appointed Pendleton as the first Judge for the federal District of Georgia. He resigned in 1796, and returned to private practice in New York. He served as a second to Alexander Hamilton in his fatal duel with Aaron Burr in 1804. Hannah Miller married James Woodland Jr. on April 15, 1796. Robert Stafford was born in England and owned property in British East Florida. When the Spanish regained control of East Florida in 1783, Stafford, his brother, and many other British landowners resettled in the United States, especially in neighboring Georgia. Stafford became a planter on Cumberland Island in Georgia. Captain William Reddy (d. 1797) was a planter who lived in British East Florida in the 1770s and moved to Camden County, Georgia, in 1787. He was one of the original founders of St. Marys, Georgia, and owned a plantation on Cumberland Island. After his death, Robert Stafford was the administrator of his estate.